Event: Fundraising event for Obstetric Fistula. 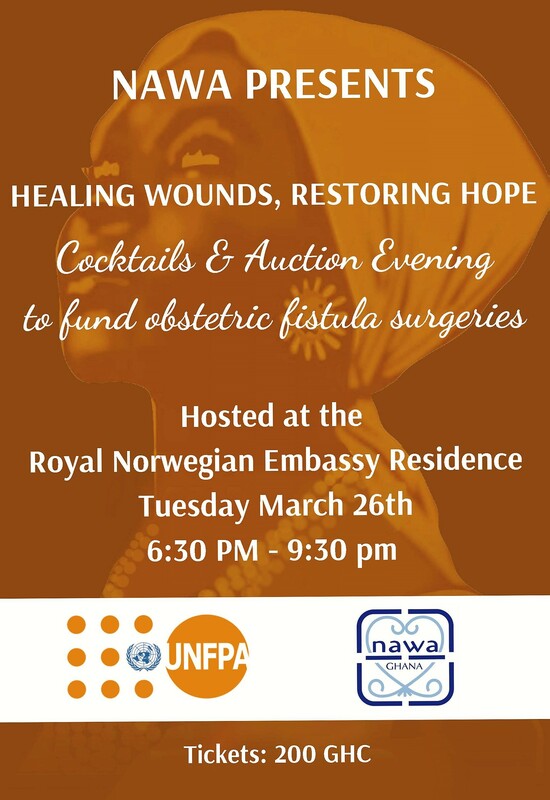 North American Women's Association (NAWA) in partnership with UNFPA GHANA, will host a Fundraising Cocktail and Auction Evening at the Norwegian Ambassador's Residence on Tuesday the 26th March. The money raised, will support the UNFPA's continued mission to complete 100 Obstetric Fistula surgeries in 100 days in 2019. Obstetric fistula, is a condition suffered by women who have endured the distressing complication of prolonged obstructed labour. It is estimated to affect over 1,300 women and young girls each year. Unfortunately, the average cost of fistula treatment, including surgery and post-operative care is well beyond the reach of most affected women in Ghana. Tickets are GHS 200 and first come first sold. Includes admission to the event, drinks and hors d'oeuvres.